Our articles now have a new home, and can be found at www.equineofficesolutions.com. Geared toward the equine industry, we're offering the same great business administration and marketing information in a new location. Come on over and visit us there! Whether you realize it or not, your audience is already using Pinterest on a regular basis to shop and explore their interests. So if you’ve been holding back from promoting your equine business there, you’re missing out on a huge opportunity. Horses are visually appealing creatures, and the equine community is extremely dedicated. So it’s only natural that Pinterest has developed into a profitable marketing tool for the equine industry at large. Not only can farms pin images of their horses, but other product based businesses will find successful marketing opportunities through Pinterest as well. Think of it - tack stores, equine jewelers, authors, artists, trainers, retailers, etc. There are currently over 70 million users on Pinterest, and 9 million of them have connected their account to Facebook, which means every pin and repin appears there as well. Don’t you want a piece of that pie? REGULAR BOARDS - these contain pins that you include for your followers to see. SECRET BOARDS - these can only be seen by you. Therefore, they’re ideal to keep track of your personal interests. Note: Pinterest only allows three secret boards per account. GROUP BOARDS - normally you can only pin to your own boards. But group boards are unique in that they allow you to collaborate with other pinners on boards. Of course you’ll want to post images of your horses or products. But it’s important to keep your followers interested, so it’s important to give them some variety. Here are some suggested themes for a few creative boards you may want to consider. I’m sure if you think outside the box you can come up with others as well. RESOURCES - Rather than just showing off your products, create a resources board to share informative content. Perhaps include pins on famous horses, “how to” articles and videos, etc. Give your followers valuable information and they’ll keep coming back.This would be a great place to promote your blog posts! OUR CUSTOMERS - Creating an “Our Customers” Board can go a long way in building trust with your audience. They will enjoy seeing the other people who are in your circle. Include testimonials, customer profiles, their business websites and recommendations. Of course, you’ll want to get their permission first, but everyone enjoys some free promotion. You could even make this a group board and let them contribute to it directly. ABOUT US - Consider creating a board dedicated to information about your company. Include images and stories about you, adding some tidbits about your personal life, like a “get to know me” section. Consider including, pictures of your promotional booth at shows, business travels, awards & recognitions, your pets and even your location and town. PRODUCT CATEGORIES - Each category of product should have it’s own unique board to further target the potential market. Also, be sure to use key words wisely so anyone searching for your items will easily be able to find them. OUR FAVORITE REPINS - Use this to repin images from other boards you are following. This will give your followers a better idea of who you are and your unique interests. Images that are predominantly red or orange see twice as many repins as other images. Add product description and price - Include additional information about your image. If it is a product, type the price (ie $9.99) into your pin description and Pinterest will automatically add a price banner to your pin! Add web links to your descriptions - add the correct permalink so they can be traced correctly. And check that your pin-links work! Include a direct call to action and you’ll see an increased rate of engagement. Think SEO - Be sure to include pertinent keywords in each image description to optimize the relevance in the search engines. Verify your website - You must first verify the ownership of your website before Pinterest will recognize it and establish a connection between your website and Pinterest. Add a “Follow Me” button to your website, email signature, promotional emails, blog posts, etc. Add a “Pin It” button to the images on your website, in your enewsletters and other digital content. Promote pinning in your emails, website, other social media platforms and marketing materials, etc. This can be effectively accomplished using the “follow me” and “pin it” buttons as mentioned above. Invite your Facebook friends - click the “invite friends’ button on the top right of your page. Create a press release announcing your arrival on Pinterest. Pin at least once a day so followers get new content in their feeds. Say “Thank You” - Periodically track the pins and repins your images have received, then visit the pinner’s board and say “Thank you”. They’ll appreciate the gesture and remember you for it. Remember, Pinterest is first and foremost a social media site, so it’s important to interact with the community. The more you engage with your audience and other members there, the more visibility your pins will receive, generating greater awareness for your brand and business. Pinterest is a website referral machine! If you think you don’t have the time to manage another social media platform remember, it takes just a few short minutes each day to pin fresh content and produce awesome engagement, promotion and results. And if managed correctly, you’ll be amazed to see how quickly your website traffic will skyrocket! Carol Aldridge is an Administrative Consultant and Support Specialist serving the equine industry for over 25 years. As founder of Equine Office Solutions, her clients across the United States enjoy customized administrative services designed to relieve workload pressure, streamline office procedures and maximize marketing results. 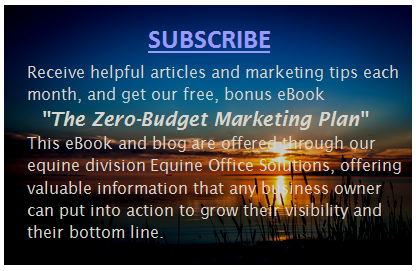 Learn more about Equine Office Solutions and find additional informative articles at www.EquineOfficeSolutions.com.